Helping a new children’s museum become reality. Many families pushing strollers on the boardwalk of historic Rye Playland probably pass the landmark bathhouses without suspecting what’s about to happen there. But soon that site will see the realization of a wonderful vision as it becomes home to the Westchester Children’s Museum (WCM). The decision to create a children’s museum began more than ten years ago around a kitchen table. Several moms felt that Westchester County ought to have a cultural, educational and recreational facility that would attract families with young children. Gradually, more supporters joined in, and in the fall of 2011, the county legislature agreed to lease the north bathhouse site to the museum. It takes thousands of volunteer hours to establish a museum, and volunteers from Yorktown to Harrison to Yonkers have given their time generously for a cause they feel strongly about. Whether young or young at heart, volunteers at WCM are making a difference by giving back to the community and helping to create something meaningful and far reaching. After years of working in school programs, I knew my passion was creating exciting educational opportunities for children. The museum project was a perfect fit. It was important for me to choose an organization that had meaning for me and had core values like the desire to make our communities better places for children. Knowing that a good volunteer has to be willing to pitch in wherever needed, I began by doing work in the museum’s campaign office. There are busy times that can be stressful as well as slow times when help may not be needed, and there’s the constant challenge of upgrading your own skills to meet new needs. To learn more about the Westchester Children’s Museum, ways to donate or volunteer opportunities, visit www.discoverwcm.org. The chance to serve on WCM’s Education Committee was a personal “aha” moment for me. Members are a talented group of educators who develop programs designed to engage Westchester’s children in fun, interactive science and creative arts activities. These programs make up the Museum Without Walls initiative. With the vision and direction of WCM’s executive director Tracy Kay, Museum the Without Walls has been reaching out to the county’s children well before the doors of the WCM open. At a time when school and community budgets are being cut, WCM is making an impact by acting as a traveling museum, taking its educational programs on the road. 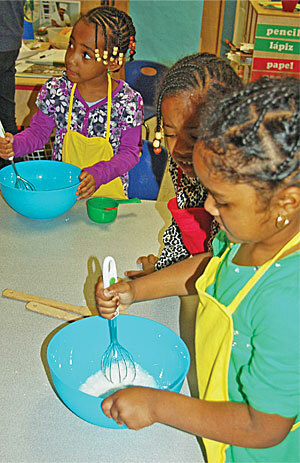 In less than two years, nearly 300 lessons have taken place at 15 sites around Westchester, including public schools, community daycare centers and afterschool and summer camp programs. I know there have been thousands of “aha” moments since the Museum Without Walls launched its programs in 2010. The jubilation can be heard in the voices of children who delight in its hands-on activities, such as building solar cars, looking through microscopes or at their hands through a “germbuster” machine, drumming on authentic African drums or being part of an archeological dig. The list of programs is large and growing. The future looks as bright as the Westchester Children’s Museum’s vision is clear and volunteers help make it a reality, which is the greatest “aha” moment of all. Beverly McAllister is an educator with 30 years of experience directing pre-kindergarten and afterschool programs in Westchester and Manhattan. She has served as volunteer coordinator for the Campaign for the Westchester Children’s Museum and is currently coordinator for the Museum Without Walls Program.